This is the seventh in a series of articles about the basics of developing SharePoint-hosted SharePoint Add-ins. You should first be familiar with SharePoint Add-ins and the previous articles in this series, which you can find at Get started creating SharePoint-hosted SharePoint Add-ins. If you have been working through this series about SharePoint-hosted add-ins, you have a Visual Studio solution that you can use to continue with this topic. You can also download the repository at SharePoint_SP-hosted_Add-Ins_Tutorials and open the BeforePage.sln file. In this article, you add a help page to the Employee Orientation SharePoint Add-in and configure it to use a custom CSS stylesheet. In Solution Explorer, right-click the Pages folder and select Add > New Item. The Add New Item dialog opens to the Office/SharePoint node. Select Page and give it the name Help.aspx. Find the two asp:Content elements in the file, and add the following third asp:Content markup in between them. Find the asp:Content element with the ID of PlaceholderAdditionalPageHead, and add the following markup to it. Find the asp:Content element with the ID of PlaceHolderMain, and remove any child elements in it. Add the following as content to the same asp:Content element. Find the asp:Content element with the ID of PlaceHolderMain, and then add the following markup to the end of it. In Solution Explorer, open the app.css file in the Contents folder, and then add the following line to the file. 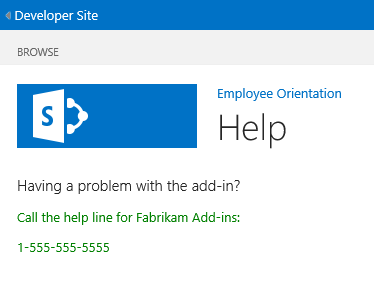 When the add-in's default page opens, select the Get help for the Employee Orientation add-in link to open the Help page. Your custom page opens and the two lines that you put in <p> tags are green. In the next article in this series, you'll add custom client-side rendering to a SharePoint-hosted SharePoint Add-in.